Accidentally deleted text messages, photos, notes, videos, and more on your iPhone? Grasp the 3 approaches to recovering the deleted or lost data on iPhone X/8/7/6/5/4 directly or iTunes/iCloud backup. Find back the deleted text messages, photos, notes, contacts, videos, music, and more. Far more than just the reasons, you may get the data lost or deletion from your iPhone. As the word says, the problem is there, and ignoring it is not going to make it go away. So, how to recover the deleted or lost data on iPhone? Use Apeaksoft iPhone Data Recovery. Part 1. 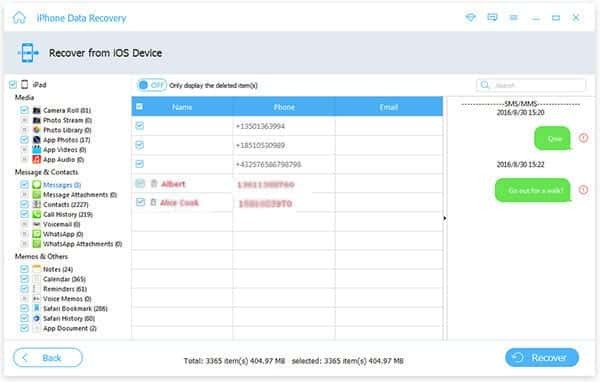 What Is Apeaksoft iPhone Data Recovery? 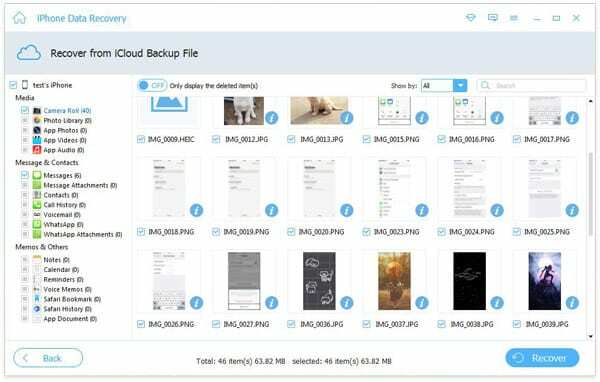 Recover up to 19 kinds of data from iPhone directly without backup. Restore the lost or deleted data from iTunes/iCloud backup when iPhone is not at hand. Recover deleted iMessages, text messages, photos, contacts, documents, notes, etc. Retrieve deleted media files like music, videos, WhatsApp data, etc. on iPhone. Compatible with the latest iOS 11, and iPhone X/8/7, iPad Pro, iPod, etc. Extract and backup the data on iPhone to computer. Part 2. 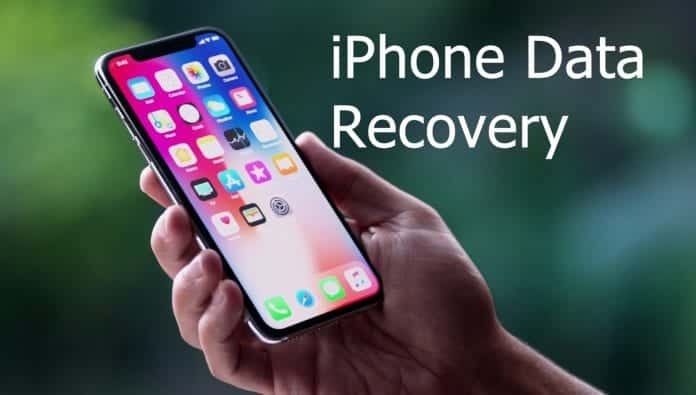 How to Recover Deleted/Lost Data on iPhone X/8/7/6/5/4? iPhone Data Recovery is capable of retrieving the deleted or lost data on iPhone in 3 ways. Now let’s check them one by one. Firstly, you need to download iPhone Data Recovery from its official site. Step 1. Download iPhone Data Recovery, install and run it immediately on your computer. Click “iPhone Data Recovery”. Connect your iPhone to computer with the USB cable. This software will detect your iPhone automatically. If not, just tap “Trust” on your iPhone. Then click “Start Scan”. Step 2. After the successful scan on your iPhone, you will find all data types are listed on the left sidebar on this program. You are allowed to click the data type and view the details on the right window. Step 1. Run this software on the computer where you have synced iPhone with iTunes before. Click “Recover from iTunes Backup File”. Step 2. Select one iTunes backup that contains the data you want to restore, click “Start Scan”. This utility will scan the iTunes backup on this computer. Step 3. After the scanning result pops up, like before, you could find all data types. Select the data that you want to recover, click “Recover” to save the deleted files from iTunes backup on iPhone to computer. Learn more here to restore iPhone from iTunes. If your iTunes backup is damaged on the computer, and iPhone is not at hand, just use the third recovery mode, recover from iCloud backup. Step 1. Launch this software on the computer that you can use, and click “Recover from iCloud Backup”. Sign in to your iCloud account. Note: This software will not remember any information from you. Please keep insured to use it. Step 2. Select the iCloud backup that you need exactly. Click “Download”. Step 3. 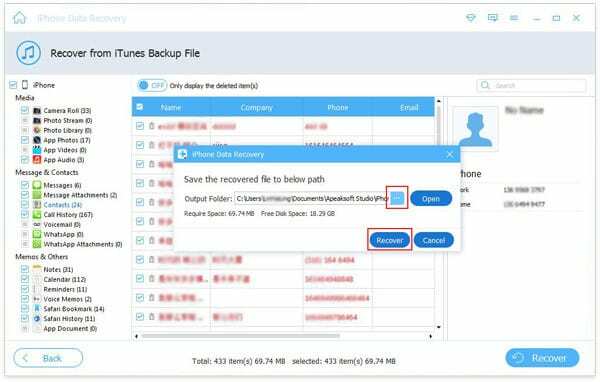 In the pop-up window, you need to tock the data type that you want to recover on iCloud backup file. Click “Next” and this software will start to scan your iCloud backup. Step 4. After the scan is complete, you can see the data type you ticked will show on the left sidebar. Click it to see the details on the right window. Checkmark the deleted items that you want to get back, and click “Recover” to copy the data from iCloud to computer. Learn more here to get to know iCloud recovery. Easy, right? Three ways make you find back all the deleted data on iPhone, whether you get a backup or not, whether your iPhone is at hand or not. iPhone Data Recovery is the professional tool to help users recover the deleted data on iPhone, its another two features, also can be your best companion in iPhone life.